Welcome to the Farmgirl Friday Blog Hop! You may be coming off a long weekend like we are. I love having the extra day from work to work in the garden and do other things around here. We are busy in the garden and busy in the kitchen with our remodel still going. Hubby got the sink out this week and by end of the weekend the new sink cabinet that he is building and our new apron sink should be in! Yipee!! For now we are using paper plates and cups and cooking on the grill. We have a sink in the basement but we figure the less dishes we make the better for a few days. Last week I loved reading the blog on Hibiscus. I have Hibiscus and yet I buy tea with Hibiscus. Michelle from Seeking Joyful Simplicity shared a tea recipe and more on Hibiscus. And who doesn’t like to put something old to good use. Lyn from Repurposed for Life showed us the new life her couch has received and boy is it pretty! There were so many good link ups last week on the hop! Keep ’em coming as I love reading them. Thank you for joining and sharing and visiting each other! It is not a hop without you. Plans for picnics, BBQs and fireworks dance in my head. My cousin’s family has moved nearby (1 hour away) YIPEE! AND we will be spending some quality family time with them this weekend. And yes gardening and lots of it this weekend. With a long weekend away from the day job that leaves much time for playing outside and getting a great farmgirl manicure. Did you see the beautiful crafts made from blue bottles last week on the blog hop? This was just one of the beautiful pictures and fun things that Lyn shared. I must admit however that these chimes were my favorite. Thanks to Lyn from sharing from Repurposed For Life. Enjoy your 4th of July. But be sure to stop by and link up your blog to show off your farmgirl skills! Here we are again at the Farmgirl Friday Blog Hop! So glad you stopped by. And the Malabar Spinach is about big enough to toss in a salad! I cannot wait to head out every day to see what is happening. And I love to head here also to see what ya’ll are doing. Last week Ginger Dawn shared a poem titled “She Let Go“. I have read this numerous times in the last week. I think we are all so busy and that makes this such a great message. If you did not read it, take a few moments by yourself and read it and let it resonate with you. I love it and we all need to stop, breath and let go over and over and over again in our lives. Enjoy reading it and thank you Ginger for sharing. Please note also that the artwork is by Ginger herself and it is beautiful. So like I said we all are busy. So take a moment and brag on what you are doing this week. Visit some other posts while you are at it. Thank you for joining. It is not a hop without you. Let’s get hopping! Glad you are here at the Farmgirl Friday Blog Hop! It has been a great week here. I think we are going to have our first tomatoes of the season in a salad tonight. So exciting. And we are heading to my parent’s this weekend to celebrate Father’s Day and my mom’s birthday. That will be much fun! If you read Ginger Dawn’s blog entry last week about her May Art challenge, you will have seen some awesome drawings and her new found passion for art. Ginger shared that she earned a MaryJane’s Farmgirl Sisterhood Badge during her May Art Challenge. How great is that! Congrats to Ginger!! What has this week brought your way? Welcome to Farmgirl Friday Blog Hop! Summer seems to have arrived! Yippee! No rain the last few days and warm temps. Garden is loving life right now and still much to plant. And we are getting another nuc of bees today. I am so excited. 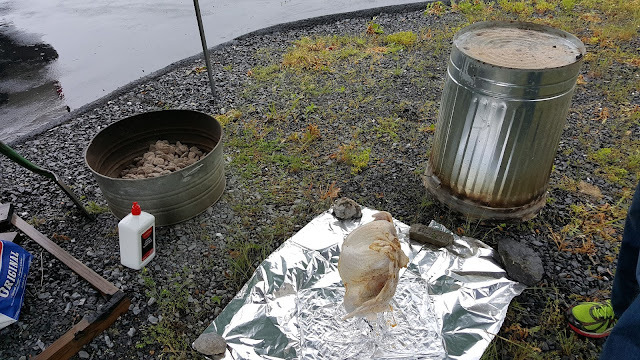 Ginger Dawn was thinking turkey though last week and shared Trash Can Turkey with us! I am intrigued!!! How about you? Thank you for sharing! Has anyone else tried this? Thank you for joining and sharing and visiting each other! This week has been a fun week of planting and working on our kitchen. Never a dull moment but that is how I like it! Gardening makes me dream of tomatoes and squash and the Sunny Italian Stew Recipe from Claudia at Avalon Media last week hit the spot! She said it was inspired by her time in Italy as a child and it looks wonderful! Be sure to check it out! Tips for Gardening with a One Year Old was also delightful! Since we just came back from playing in the dirt with our daughter’s family (which includes an almost 2 year old) it seemed to be perfect timing for this read. Thank you Frugal Mama for sharing! What are you up to? Late spring is full of action isn’t it? Welcome to all and thank you for joining! Well we are back from Georgia. We had so much fun visiting our family, building a raised bed, cleaning out some other areas around the house and planting in them and of course spending time with our rockstar of a grandson! A blog will be forthcoming on our outside fun! All our entries on our little blog hop here as so awesome on a weekly basis. One of the blogs I love to read are the ones titled “Homestead Hack” and then it can be on a variety of topics. We all love hacks so I always check those out. Last week, a simple yet effective way to dice tomatoes and not have juice dripping down your cabinets was great! And the best thing about it was, as all hacks, you probably have what you need laying around your house. Thank you Taylor for sharing! (I am going to make you head over there for the hack instead of spoiling it for you). Let’s get going on this week’s shall we? Brag on what you are up to this week. Here are some guidelines if you are new here. It has been a fun week here since it is Derby week. I will posting a blog later on some Derby Week Fun that we have had. In between it has been rainy but today is gorgeous so I am looking forward to heading outside later and playing in the dirt! Have you ever made seed bombs? If not Maple Hill Farm shared a great tutorial on making these. They look like so much fun! Thanks for sharing every week. I continue to learn and learn and be inspired. Beautiful skies here today but much, much rain is coming in so I don’t think it will be a gardening weekend (much to my dismay). I love starting green babies and I am obsessed with tomatoes so I really enjoyed reading “How to Start Heirloom Tomatoes from Seed” from The Modern Day Settler. Aren’t they just beautiful?? I love, love, love varieties on the tomato front. I cannot wait to sink my teeth into my first tomato of the season (still several weeks off…). Thanks for sharing on the hop some great tips and pictures! I couldn’t resist and popped a couple of our tomato plants in large pots on the deck this week. It is too early for ground here, but I could bring a pot in if I had to. And these darn things are jumping out of their starter pots and getting blooms. They are itching for the garden! So this weekend without the garden, means more work in the kitchen! Yipee. Hubby is getting the shelving in that he has been crafting. It is so pretty! I could not resist and grabbed a couple of things to pop on the top shelf after it was done! The rest will get into day and tomorrow. What are you up to? Ready to join the hop and brag a little about what is going on with you? Let’s get hopping! AND be sure to visit the others! Welcome back to the Farmgirl Friday Blog Hop! After a week off the blog hop and two weeks away from blogging I am happy to be here with you again. We had a wonderful vacation in Quebec and Montreal! It was a wonderful trip and 11th anniversary celebration! I have not been up to much here at the farm, but we did get our farm number which is exciting and will now allow us to work with the USDA and others on grants and assistance. This weekend holds a long task list and a bit of catching up. Is it spring yet for you? Our friends in Colorado are expecting a winter storm! I am sure they are hoping for springtime soon.